Well-researched story of the fight for union representation in Smithfield’s North Carolina hog slaughterhouse. All the players in the union vs. Smithfield fight are examined in Hog Wild. The book also describes how modern vertical integration moved from chicken to hog slaughtering. It includes cringeworthy details of what the hogs endure during the birth to bacon process. 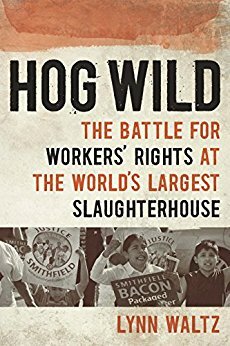 Hog Wild has much to say about the use of right-to-work rural states and non-white and/or illegal workforce to lower costs. Smithfield is shown using violence, threats, intimidation and ultimately lawsuits to avoid unionization. Union membership dropped by more than two thirds since the 1950s. Hog Wild postulates that the drop is correlated with stagnant wages and a similar drop in the size of America’s middle class. The book is clearly on the union’s side and anti-Republican. However, that is not my biggest issue with the book. The author is constantly caught up in seemingly extraneous details. Worse, there are large swaths of Hog Wild that were just boring. It reads like a Master’s thesis trying to reach a particular length. Indeed in the preface, the author states that was the genesis of the book. Clearly, Hog Wild includes a tale that needs to be told. But it is a hard slog through so many facts. Consequently, the book receives only 2 stars from me. Thanks to the publisher, University of Iowa, and NetGalley for an advanced copy.